This is an interview with Elizabeth Corwin, a 12-year military officer and former Navy F-18 pilot who began teaching yoga to the military community while on deployment aboard the aircraft carrier U.S.S. Truman. 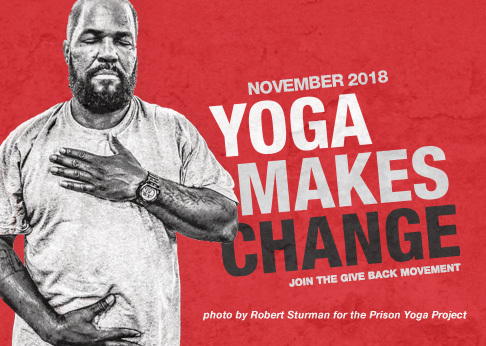 She continues to teach yoga to active duty personnel, veterans and military communities nationally and abroad with the support of the Give Back Yoga Foundation. Rob: You must get some interesting reactions when your students learn you were a Navy pilot. How do you navigate that question? Rob: A tough question to answer as you’re on the verge of going into a class session. How have you decided to respond? Sometimes I can’t quite summon a quick response, but my heart is always urging me to respond “No, they’re quite similar.” But my best defense with such a challenging question is often an unaggressive shrug. Rob: How has your practice helped you counter this seeming contradiction in these parts of your life? In my years of yoga practice, I’ve immersed myself in the yogic concepts of the warrior: faith (shradda), discipline (tapas), love, and most importantly seva (service). My meditations on the core concepts of the yogic tradition have helped me question why I think serving in the military, a world of fierce competition and conflict, resembles the beautiful ancient unifying art of yoga. They are the same, my gut adamantly repeats, and my intuition has never let me down before. Discipline, love, service — I have come to see these as the practices upon which both a military life and a yogic life are founded upon. Rob: Yes, I can see that, too. How do you present these connections to your students? In terms of discipline, I like to share about my 70-year-old teacher in Mysore, India, who reminded me of an old Gunnery Sergeant. When it came to our daily 4:30 a.m. Ashtanga class, there was no chance in hell I wanted to be on the receiving end of a severe glance from her earnest, all-seeing eyes. After practice ended, I would roll up my battle-weathered mat and hesitantly approach her. She sat with her ankles crossed, hands folded in her lap, and observed the class with a tenderness and intensity that rarely coexist. I lowered to my knees and bowed at her feet, a new gesture and yet one so familiar. Vande gurunam charanaravinde: “I bow to the lotus feet of our greatest teachers.” This gesture of respect is very similar to the salute between ranks and to the American flag throughout my career. Rob: You make the parallels seem so evident. Whether in the Navy, Army, Air Force, Marines or Coast Guard, discipline is what helps keep them united. It is the glue that keeps everyone integrated, whole, and functioning smoothly. This is no different as yoga practitioners. Our discipline to our practice, not just on the mat, but off the mat as well, keeps us integrated and balanced. We cultivate a discipline of commitment to opening our eyes to truth, love, and understanding. It reconnects us to the truest version of ourselves, holding us accountable to embodying the open-hearted, open-minded warriors we strive to be. Rob: It’s a way of holding reverence for what we value, right? Yes, my heart is humbled by the simple reverent gestures of bowing and saluting. Not just to our teachers, to each other, to the flag, but to our oneness. These gestures remind us we are part of something larger than ourselves. Bowing to Saraswathi felt like I was bowing to the ultimate teacher in all of us; she simply became my humble guide. The same was true of saluting Gunny Smith while I was still a student. On the day I became a new officer in the Navy, it was Gunny Smith who then honored me with my first salute. My eyes filled with tears as he performed this simple dutiful gesture that was larger than either one of us. It reminded us that we were united and dedicated to serving the same higher purpose – freedom. Whether some are fighting in the military or simply fighting for our own truth (satya) on the yoga mat, discipline is the key to success. In essence, our discipline to truth and love becomes our greatest gift, our greatest salutation, to ourselves and to others. Rob: Your second foundation is love? How is love found in the military life? I once read that a warrior’s greatest strength is in the ability to love. Too often we are told that love is a weakness or that real power is preserved by fortifying our hearts. That if we are to be warrior-strong, we must hide these disarming emotions. But love is the source of fire for a warrior. It is the motivation that provides stamina when faced with adversity. Love for family, for fellow warriors, for justice, for tolerance, and for freedom. Without love, there is no reason to fight. There is no reason to leave family, friends, and home for 9-12 months risking life and limb in dangerous conditions. Love is the ultimate source of sustainment for a warrior. And if love is the fire, faith is the bellow that keeps the embers hot even when the fire begins to cool, or doubt creeps in. Faith and love are the scaffolding of a service member’s toughness; they support physical and emotional strength and courage. Rob: That’s helpful. And it certainly resonates with the way love is viewed in the practice of yoga. Yes, love is often what calls us as yogis. When we practice, all of the tension, the stress, the blockages, and the knots are unbound and in this clearing our hearts are allowed to awaken to the fountain of strength that is already within. Love gives us the courage to forgive, to let go, to accept, and to move on from situations that are no longer serving our lives. It is stronger than any other emotion. We sometimes just need to get out of our own way to harness it. Even when this awakening is not always physical or tangible, our faith (shraddha), is strong enough to bring us back to our mat time and time again. Rob: I can see that this would be very appealing to military communities you work with. I want to show my students that love IS a true warrior’s greatest strength. When we allow ourselves to be overwhelmed with love in our hearts, there is nothing we won’t have the courage to discover. Forgiveness. Acceptance. Understanding. Compassion. Freedom. These are the common threads of the warrior spirit. Rob: And that brings us to your third term of similarity between your life in the military and your life as a yogi — service, or seva. Can you say more about that? Any service member will admit, if you want to be rich, don’t join the military. Any yoga teacher can probably tell you the same. And yet, we all still choose to serve in our own way. Some would even say they are “called” to serve. Not just those is our yoga classes, or those next to us in crisis, but ultimately called to serve the betterment of all living things. We are called to fight for justice and truth. This is not about whether you agree with the decisions the government has made in our recent and past engagements, but the military title “service member” lives up to its name regardless. It is a community committed to serving strangers, family, friends, and those who often cannot defend themselves. Military members are called to action to fight for peace and freedom. To serve honorably and courageously is a service member’s highest intention. My brother is currently deployed, and had left behind his 4-month old daughter and 2-year old son for Christmas. There aren’t many people I know outside of the military that would be willing to deal with this year after year. But to him, there simply was no other choice. He is serving his country, his family, and ultimately, the ideals we hold of humanity. Rob: And of course, seva is an integral part of the yogic tradition. Indeed. As yogis we are our own type of “service members.” We advocate for tolerance, peace, and compassion, on and off the mat, for strangers, family, and friends. Our energy is never lost if it is of pure intention, and there is nothing more noble than giving ourselves through seva. It purifies our souls, releases the ego, and ignites the embers in your heart to a fiery blaze. Anyone who has ever served another knows the power behind this feeling. Seva is a shared duty of both the GI and the yogi. Rob: It’s clear that you have a deep calling to teach yoga. How did you begin to bring these two worlds together in your own life? Rob: Yikes, did you get an answer? No, but I thought, “That wasn’t very yogic, Liz.” Then I realized it was the question to be asked, but it was not solely his question to answer. I had to ask myself, what was he afraid of, and could I possibly find a way to absolve this fear? Now I am no Special Ops, but as a fellow service member, I understood his fear of slowing down. I understood his fear of letting go of the stress and intensity; it was his protection. It kept his nervous system on high alert and situated in “fight status” which allowed him to perform his job safely. But maybe, just maybe, I could guide him to an hour of slowing down, breathing softly, moving with a different kind of intention. I knew yoga could offer him a place of balance. Rob: Pretty powerful lesson for you as a teacher, right? It was. In that moment I realized my calling was to continue finding ways to share the transformational benefits of yoga to this community. This is one of the ways I hope to serve. Rob: And it helps you lead others to their highest service, too. We all have a purpose, a way to connect deeply with life, a way of giving our time, our energy, our understanding, and our love unconditionally. But to do this, we must continue to foster our own warrior spirit. Discipline. Love. Service. These will keep us ready as warriors, strong and spiritually tough, so that we can fan our own flame in order to give to our own higher purpose. Rob: And what do you say now if someone questions the two warrior roles you have lived? Being a Navy pilot and a yoga teacher is not at all contradictory or hypocritical. They share the same callings. Both the military and the practice of yoga call us to be something more, to reach higher than ourselves. In this sense, they couldn’t be more similar. There is a WARRIOR in all of us. If you would like to use your warrior spirit to serve Veterans in your own community, please visit WalkaboutYoga, the Give Back Yoga Foundation, or Malaforvets to find out more. Liz will also be hosting a “Bringing Yoga to Military Communities” weekend workshop, open to all, at Omega Institute in Rhinebeck, NY, August 2017. More info at www.eomega.org.